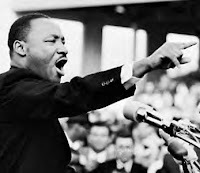 Dr. Martin Luther King, Jr. had a dream. He had a vision. He was searching for something and he was demanding something. This thing he dreamt about and was searching for was--in one simple word--"justice." As a police officer, isn't that what we are supposed to strive for---to see that justice is served?? But what is justice. The Catechism of the Catholic Church defines justice, which is one of the four cardinal virtues as, "the moral virtue that consists in the constant and firm will to give their due to God and neighbor." It continues and says that, "Justice toward men disposes one to respect the rights of each and to establish in human relationships the harmony that promotes equity with regard to persons and to the common good." (1807 CCC) Equality and fairness for the common good. It is so easy to say that we want justice but really another to put this into practice. You see--to be true--justice has to be for all. This is difficult in a society that puts self above others. This is difficult when we face this tendency to sin and always try to better ourselves. For the poor, we want to give money to charities but not get our hands dirty. Or worse, we figure we pay our taxes and expect government to take care of the them with welfare and food stamps---a system that has been proven to fail. We want justice for the criminals, but we only want to incarcerate them with no idea of how to minister to them or to help them so that they can better themselves without feeling that they have to turn to crime. We want to put walls on our borders so that illegal immigrants can't come into our country without wondering how immigration reform might allow people to come to our country legally to better themselves and their family. In our places of employment, we speak ill of our co-workers. Through gossip or complaining we raise ourselves up by making other's think better of us. Yes, it's difficult not to think of ourselves first and to forget others. After all---they are probably doing the same and why should we work harder if they don't? Why should we be victims without wanting our revenge? Why should we let others into our country to enjoy it's benefits? Why should we work at the soup kitchens or thrift stores if they are just going to live off of Uncle Sam and our taxes and not do any work? We need to do this because that's the way God designed us. Dr. King dreamt that we would see everyone as being made in the image and likeness of God. Until we do that and realize that we are all parts of the body of Christ then justice will not be served.